Product features • air conditioners can be divided into two types according to their performance: single and cold; • explosion-proof air conditioners are based on domestic and foreign brands of air conditioners; Explosion-proof design is carried out in accordance with the requirements of GB3836 series of standards, and explosion-proof processing is conducted by using special processing techniques and manufacturing methods. 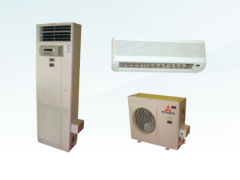 • can choose air conditioner brand according to user requirements; • the pipe connection of explosion-proof air conditioner is consistent with that of ordinary air conditioner. The electrical connection shall be conducted according to the installation process requirements of explosion-proof electrical appliances, and the power supply shall be firstly introduced into • explosion-proof control box, and then separately introduced into the room from the explosion-proof control box Machine and outdoor machine; • equipped power switch in explosion-proof control box; • when all explosion-proof air conditioners leave the factory, they are provided with a full set of product technical data and installation instructions. Users are required to strictly follow the instructions for installation and use. • pipe or cable wiring.